To build a repository of used car prices and identify trends based on data available from used car dealers. The solution to the problem necessarily involved building large scale crawlers to crawl & parse thousands of used car dealer websites everyday. Our initial Infrastructure consisted of a crawling, parsing and database insertion web services all written in Python. When the crawling web service finishes with crawling a web site it pushes the output data to the database & the parsing web service picks it from there & after parsing the data, pushes the structured data into the database. Bottlenecks: Writing the data into database and reading it back proved be a huge bottleneck and slowed down the entire process & left to high & low capacity issues in the crawling & parsing functions. High Processing Cost: Due to the slow response time of many websites the parsing service would remain mostly idle which lead to a very high cost of servers & processing. We tried to speed up the process by directly posting the data to the parsing service from crawling service but this resulted in loss of data when the parsing service was busy. Additionally, the approach presented a massive scaling challenge from read & write bottlenecks from the database. To overcome the above mentioned problems and to achieve the ability to scale we moved to a new architecture using RabbitMQ. In the new architecture crawlers and parsers were Amazon EC2 micro instances. We used Fabric to push commands to the scripts running in the instances. The crawling instance would pull the used car dealer website from the website queue, crawl the relevant pages and push output the data to a crawled pages queue.The parsing instance would pull the data from the crawled pages queue, parse them and push data into parsed data queue and a data base insertion script would transfer that data into Postgres. This approach speeded up the crawling and parsing cycle. Scaling was just a matter of adding more instances created from specialized AMIs. We suffered data losses every time there was a deployment & maintenance issues. Due to the tradeoff we were forced to make between speed and persistence of data in RabbitMQ, there was a chance we lost some valuable data if the server hosting RabbitMQ crashed. The concept of having multiple queues and multiple crawlers and parsers pushing and pulling data from them gave us a chance to scale the infrastructure massively. We were looking for solutions which could help us overcome the above problems using a similar architecture but without the headache of deployment & maintenance management. The architecture, business logic & processing methods of using Iron.io & Ironworkers were similar to RabbitMQ but without the deployment & maintenance efforts. All our code is written in python and since Iron.io supports python we could set up the crawl & parsing workers and queues within 24 hours with minimal deployment & maintenance efforts. Reading and writing data into IronMQ is fast and all the messages in IronMQ are persistent and the chance of losing data is very less. Apache Kafka is a distributed publish-subscribe messaging system. It was originally developed at LinkedIn Corporation and later on became a part of Apache project. Kafka is a fast, scalable, distributed in nature by its design, partitioned and replicated commit log service. It is designed as a distributed system which is very easy to scale out. It offers high throughput for both publishing and subscribing. It supports multi-subscribers and automatically balances the consumers during failure. It persist messages on disk and thus can be used for batched consumption such as ETL, in addition to real time applications. In this article, I will highlight the architecture points, features and characteristics of Apache Kafka that will help us to understand how Kafka is better than traditional message server. I will compare the traditional message serverRabbitMQ and Apache ActiveMQcharacteristics with Kafka and discuss certain scenarios where Kafka is a better solution than traditional message server. In the last section, we will explore a working sample application to showcase Kafka usage as message server. Complete source code of the sample application is available on GitHub. A detailed discussion around sample application is in the last section of this article. A stream of messages of a particular type is defined as a topic. A Message is defined as a payload of bytes and a Topicis a category or feed name to which messages are published. A Producer can be anyone who can publish messages to a Topic. The published messages are then stored at a set of servers called Brokers or Kafka Cluster. Producer can choose their favorite serialization method to encode the message content. For efficiency, the producer can send a set of messages in a single publish request. Following code examples shows how to create a Producer to send messages. For subscribing topic, a consumer first creates one or more message streams for the topic. The messages published to that topic will be evenly distributed into these streams. Each message stream provides an iterator interface over the continual stream of messages being produced. The consumer then iterates over every message in the stream and processes the payload of the message. Unlike traditional iterators, the message stream iterator never terminates. If currently no message is there to consume, the iterator blocks until new messages are published to the topic. Kafka supports both the point-to-point delivery model in which multiple consumers jointly consume a single copy of message in a queue as well as the publish-subscribe model in which multiple consumers retrieve its own copy of the message. Following code examples shows a Consumer to consume messages. The overall architecture of Kafka is shown in Figure 2. Since Kafka is distributed in nature, a Kafka cluster typically consists of multiple brokers. To balance load, a topic is divided into multiple partitions and each broker stores one or more of those partitions. Multiple producers and consumers can publish and retrieve messages at the same time. Kafka has a very simple storage layout. Each partition of a topic corresponds to a logical log. Physically, a log is implemented as a set of segment files of equal sizes. Every time a producer publishes a message to a partition, the broker simply appends the message to the last segment file. Segment file is flushed to disk after configurable numbers of messages have been published or after a certain amount of time elapsed. Messages are exposed to consumer after it gets flushed. Unlike traditional message system, a message stored in Kafka system doesn’t have explicit message ids. Messages are exposed by the logical offset in the log. This avoids the overhead of maintaining auxiliary, seek-intensive random-access index structures that map the message ids to the actual message locations. Messages ids are incremental but not consecutive. To compute the id of next message adds a length of the current message to its logical offset. Consumer always consumes messages from a particular partition sequentially and if the consumer acknowledges particular message offset, it implies that the consumer has consumed all prior messages. Consumer issues asynchronous pull request to the broker to have a buffer of bytes ready to consume. Each asynchronous pull request contains the offset of the message to consume. Kafka exploits the sendfile API to efficiently deliver bytes in a log segment file from a broker to a consumer. Unlike other message system, Kafka brokers are stateless. This means that the consumer has to maintain how much it has consumed. Consumer maintains it by itself and broker would not do anything. Such design is very tricky and innovative in itself. It is very tricky to delete message from the broker as broker doesn’t know whether consumer consumed the message or not. Kafka innovatively solves this problem by using a simple time-based SLA for the retention policy. A message is automatically deleted if it has been retained in the broker longer than a certain period. This innovative design has a big benefit, as consumer can deliberately rewind back to an old offset and re-consume data. This violates the common contract of a queue, but proves to be an essential feature for many consumers. Consider a distributed system with multiple servers, each of which is responsible for holding data and performing operations on that data. Some potential examples are distributed search engine, distributed build system or known system like Apache Hadoop. One common problem with all these distributed systems is how would you determine which servers are alive and operating at any given point of time? Most importantly, how would you do these things reliably in the face of the difficulties of distributed computing such as network failures, bandwidth limitations, variable latency connections, security concerns, and anything else that can go wrong in a networked environment, perhaps even across multiple data centers? These types of questions are the focus of Apache ZooKeeper, which is a fast, highly available, fault tolerant, distributed coordination service. Using ZooKeeper you can build reliable, distributed data structures for group membership, leader election, coordinated workflow, and configuration services, as well as generalized distributed data structures like locks, queues, barriers, and latches. Many well-known and successful projects already rely on ZooKeeper. Just a few of them include HBase, Hadoop 2.0, Solr Cloud, Neo4J, Apache Blur (incubating), and Accumulo. Figure 4 above shows typical ZooKeeper ensemble in which one server acting as a leader while the rest are followers. On start of ensemble leader is elected first and all followers replicate their state with leader. All write requests are routed through leader and changes are broadcast to all followers. Change broadcast is termed as atomic broadcast. Usage of Zookepper in Kafka: As for coordination and facilitation of distributed system ZooKeeper is used, for the same reason Kafka is using it. 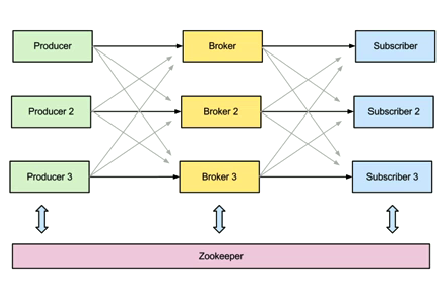 ZooKeeper is used for managing, coordinating Kafka broker. Each Kafka broker is coordinating with other Kafka brokers using ZooKeeper. Producer and consumer are notified by ZooKeeper service about the presence of new broker in Kafka system or failure of the broker in Kafka system. As per the notification received by the Zookeeper regarding presence or failure of the broker producer and consumer takes decision and start coordinating its work with some other broker. Overall Kafka system architecture is shown below in Figure 5 below. 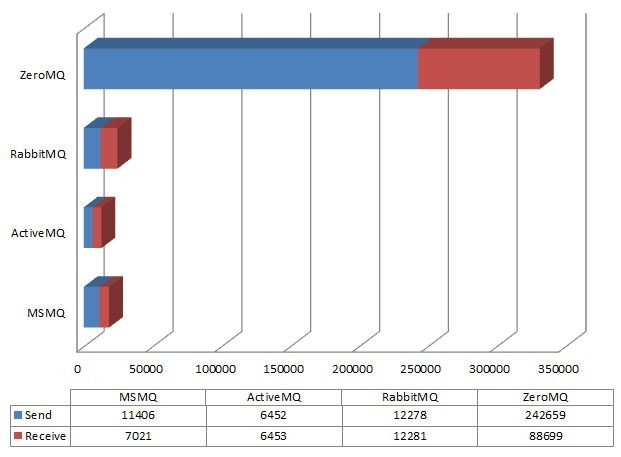 LinkedIn team conducted an experimental study, comparing the performance of Kafka with Apache ActiveMQ version 5,4 and RabbitMQ version 2.4. They used ActiveMQ’s default persistent message store kahadb. LinkedIn ran their experiments on two Linux machines, each with 8 2GHz cores, 16GB of memory, 6 disks with RAID 10. Two machines are connected with a 1GB network link. One of the machines was used as the Broker and the other machine was used as the Producer or the Consumer. Kafka producer doesn’t wait for acknowledgements from the broker and sends messages as faster as the broker can handle. Kafka has a more efficient storage format. 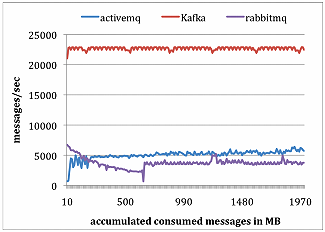 On average, each message had an overhead of 9 bytes in Kafka, versus 144 bytes in ActiveMQ. This is because of overhead of heavy message header, required by JMS and overhead of maintaining various indexing structures. LinkedIn observed that one of the busiest threads in ActiveMQ spent most of its time accessing a B-Tree to maintain message metadata and state. For consumer test LinkedIn used a single consumer to retrieve a total of 10 million messages. LinkedIn configured all systems so that each pull request should prefetch approximately the same amount data—up to 1,000 messages or about 200KB. For both ActiveMQ and RabbitMQ, LinkedIn set the consumer acknowledgement mode to be automatic. The results are presented in Figure 7. Kafka has a more efficient storage format; fewer bytes were transferred from the broker to the consumer in Kafka. 70,000+ unique instruments parsed daily. Messages contain PDF, Word documents, Excel files and certain other formats. OTC prices are also extracted from the attachments. Because of the performance limitations of traditional message servers, as message queue becomes large while processing large attachment files, our project was facing serious problems and JMSqueue needed to be started two to three times in a day. Restarting a JMS Queue potentially loses the entire messages in the queue. Project needed a framework which can hold messages irrespective of the parser (consumer) behavior. Kafka features are well suited for the requirements in our project. Fetchmail utility is used for remote-mail retrieval of messages which are further processed by the usage of Procmail utility filters like separate distribution of attachment based messages. Each message is retrieved in a separate file which is processed (read & delete) for insertion as a message in message server. Message content is retrieved from message server queue for parsing and information extraction. Sample application is modified version of the original application which I am using in my project. I have tried to make artifacts of sample application simple by removing the usage of logging and multi-threading features. Intent of sample application is to show how to use Kafka producer and consumer API. Application contains a sample producer (simple producer code to demonstrate Kafka producer API usage and publish messages on a particular topic), sample consumer (simple consumer code to demonstrate Kafka consumer API usage) and message content generation (API to generate message content in a file at a particular file path)API. Below Figure shows the components and their relation with other components in the system. Sample application has a similar structure of the example application presented in Kafka source code. Source code of the application contains the ‘src’ java source folder and ‘config’ folder containing several configuration files and shell scripts for the execution of the sample application. For executing sample application, please follow the instructions mentioned in ReadMe.md file or Wiki page on Github website. Application code is Apache Maven enabled and is very easy to setup for customization. Several Kafka build scripts are also modified for re-building the sample application code if anyone wants to modify or customize the sample application code. Detailed description about how to customize the sample application is documented in project’s Wiki page on GitHub. Now let’s have a look on the core artifacts of the sample application. * Instantiates a new Kafka producer. Above code snippet has basic Kafka producer API usage like setting up property of the producer i.e. on which topic messages are going to publish, which serializer class we can use and information regarding broker. Basic functionality of the class is to read the email message file from email directory and publish it as a message on Kafka broker. Directory is watched using java.nio.WatchService class and as soon as email message is dumped in to the directory it will be read up and published on Kafka broker as a message. * Creates the consumer config. Above code shows basic consumer API. As mentioned above consumer needs to set stream of messages for consumption. In run method this is what we are doing and then printing a consumed message on the console. In my project we are using to feed into the parser system to extract OTC prices. We using Kafka as the message server currently in our QA system as Proof of Concept (POC) project and the overall performance looks better than JMS message server. One positive feature we are excited about is the re-consumption of messages which enables our parsing system to re-parse certain messages as per the business needs. Based on the positive response of Kafka we are now planning to use it as a log aggregator and analyze logs instead of using Nagios system. Kafka is a novel system for processing of large chunks of data. 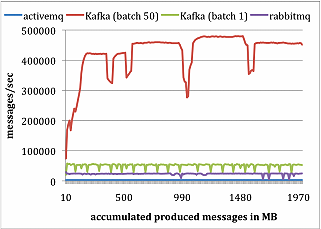 Pull-based consumption model of Kafka allows a consumer to consume messages at its own speed. If some exception occurs while consuming the messages, the consumer has always a choice to re-consume the message. Apache has released Kafka 0.8, the first major release of Kafka since becoming an Apache Software Foundation top level project. Apache Kafka is publish-subscribe messaging implemented as a distributed commit log, suitable for both offline and online message consumption. It is a messaging system initially developed at LinkedIn for collecting and delivering high volumes of event and log data with low latency. The latest release includes intra-cluster replication and multiple data directories support. Request processing is also now asynchronous, implemented via a secondary pool of request handling threads. Log files can be rotated by age, and log levels can be set dynamically via JMX. A performance test tool has been added, to help fix existing performance concerns and look for potential performance enhancements. Kafka is a distributed, partitioned, replicated commit log service. Producers publish messages to Kafka topics, and consumers subscribe to these topics and consume the messages. A server in a Kafka cluster is called a broker. For each topic, the Kafka cluster maintains a partition for scaling, parallelism and fault-tolerance. Each partition is an ordered, immutable sequence of messages that is continually appended to a commit log. The messages in the partitions are each assigned a sequential id number called the offset. The offset is controlled by the consumer. The typical consumer will process the next message in the list, although it can consume messages in any order, as the Kafka cluster retains all published messages for a configurable period of time. This makes consumers very cheap, as they can come and go without much impact on the cluster, and allows for offline consumers like Hadoop clusters. Producers are able to choose which topic, and which partition within the topic, to publish the message to. Consumers assign themselves a consumer group name, and each message is delivered to one consumer within each subscribing consumer group. If all the consumers have different consumer groups, then messages are broadcasted to each consumer. 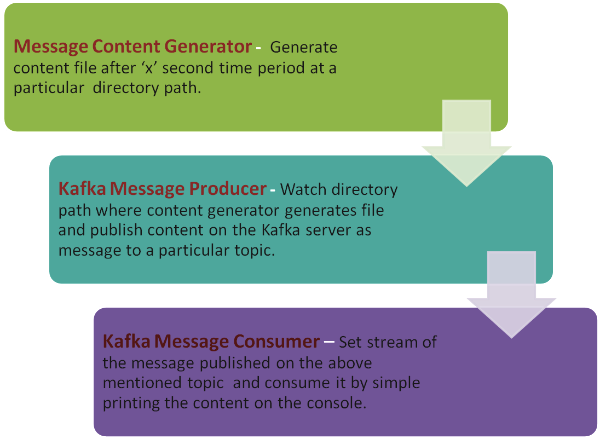 Kafka can be used like a traditional message broker. It has high throughput, built-in partitioning, replication, and fault-tolerance, which makes it a good solution for large scale message processing applications. Kafka can also be used for high volume website activity tracking. Site activity can be published, and can be processed real-time, or loaded into Hadoop or offline data warehousing systems. Kafka can also be used as a log aggregation solution. Instead of working with log files, logs can be treated a stream of messages. Kafka is used at LinkedIn and it handles over 10 billion message writes per day with a sustained load that averages 172,000 messages per second. There is heavy use of multi-subscriber support, both from internal and external applications that make use of the data. There is a ratio of roughly 5.5 messages consumed for each message produced, which results in a daily total in excess of 55 billion messages delivered to real-time consumers. There are 367 topics that cover both user activity topics and operational data, the largest of which adds an average of 92GB per day of batch-compressed messages. Messages are kept for 7 days, and these average at about 9.5 TB of compressed messages across all topics. In addition to live consumers, there are numerous large Hadoop clusters which consume infrequent, high-throughput, parallel bursts as part of the offline data load. To get started, visit the official Apache Kafka documentation page from where you can learn more and download Kafka. There is also a paper from LinkedIn titled Building LinkedIn’s Real-time Activity Data Pipeline, which talks about why Kafka was built and the factors that contributed to Kafka’s design. I have spent an interesting week evaluating various Message Queue products. The motivation behind this is a client that has somewhat high performance requirements. They have bursts of over a million simultaneous messages. Currently they’re using a SQL server based solution, but it’s not ideal, and I’m suggesting they look at Message Queuing products as an alternative.